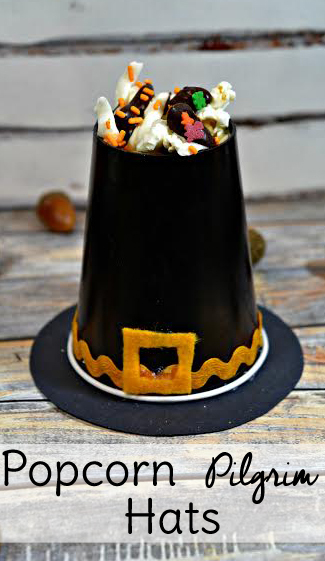 Thanksgiving turkey crafts abound, so why not mix things up a little with a pilgrim hat instead? 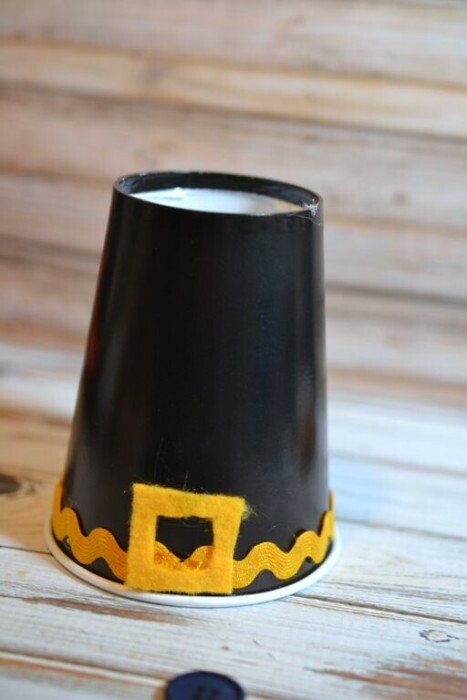 This pilgrim hat craft makes a cute Thanksgiving table setting or Thanksgiving craft for kids. 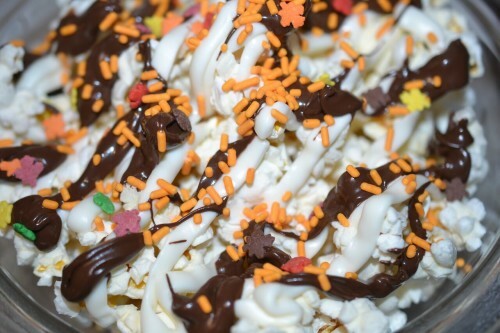 Add some popcorn to make it tasty. 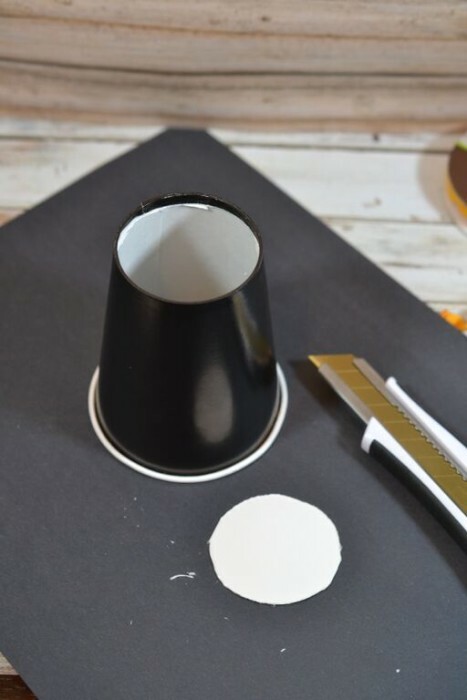 Use an exacto knife to cut the bottom of each cup off. 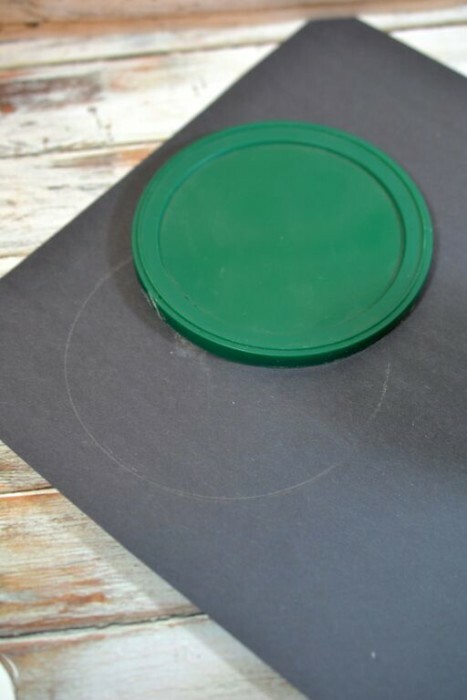 Trace a circle shape that is slightly larger than the drinking rim of the cup onto black construction paper (food container lids work great for this!) Cut it out using scissors. Hot glue the gold ric-rac around the base of the cup. Melt the candy melts according to the directions. Spoon the melted candy into a zipper bag. Cut a very small hole in the corner of the bag and drizzle over the popcorn. Quickly add the fall sprinkles before the chocolate melts harden. 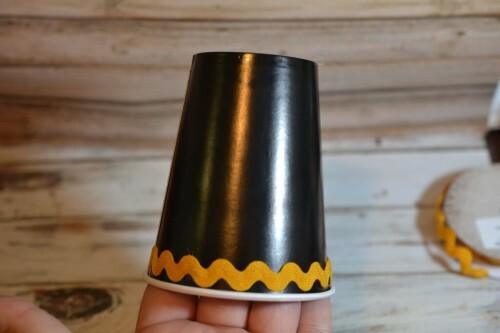 Allow popcorn to sit for a few minutes then add it to the pilgrim cups. Yum! 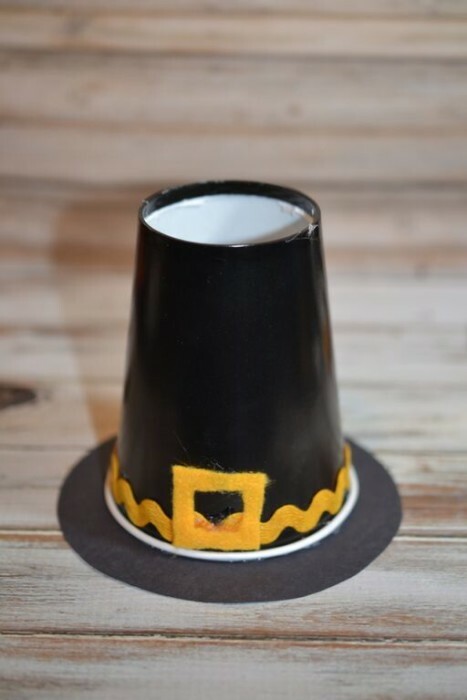 Make this pilgrim hat craft with your child for their school Thanksgiving celebrations or just save all the goodies for yourself. I don’t judge. 😉 These little pilgrim hats make a great Thanksgiving table setting for the kids table or the grown-ups! Fill them with nuts, cheese straws, or another savory treat for your guests to enjoy as an appetizer while you’re working on getting the turkey out of the oven. « Hilton Sandestin Beach Golf Resort & Spa: A Review and Some Tips!